It's funny how a book can be dragging on forever, a real torture to read, and then suddenly end on an entirely different note, that makes you forget everything you just went through. It is always the ending that lingers on when the book is closed. It is always the ending that determines how you end up remembering a book. The ending can blind you, hypnotize you and make you forget. It can leave you in a dreamy haze, it can whisk away your memories of the first chapters. Isn't it a bit misguided? The ending of this particular novel left a glistening tear on my cheek and a deep pain in my heart. The last 100 pages flew by in a speedy blur, making me late for bed. The last chapters were a perfect mix of interesting philosophies, beautiful phrases and deep, despairingly real feelings. I could have lived in those last 100 pages forever; and if I had Henry's abilities, I would keep traveling to that particular point in time. It was so beautiful. I seriously considered giving this book five stars - but then I remembered the beginning and the middle of the novel. And then I considered giving it two stars instead. The fact is, most of this book was a struggle. I could never fully grasp Niffenegger's time concept and I did stumble upon some huge plot holes with no plausible explanation. Parts of the love story were bizarre and disturbing as well; not really romantic or swoon-worthy at all. I never found out whether Henry and Clare become lovers because they're meant to be, or just because they know how it all will end. Determinism or free will? The novel was extremely vague on that point the whole way through. I have settled upon three stars; as the plot is not well-balanced or even harmonious in its structure. The beginning is dull, the middle is pointless and the ending is a true firework of brilliance. I'm very happy I made it through, because in some ways the ending is worth all the struggle. I wouldn't have missed that for the world. This is a different kind of love story; and perhaps it is more a tale of growing up and growing old, and a intricate study of how people can influence you and define you as a person. 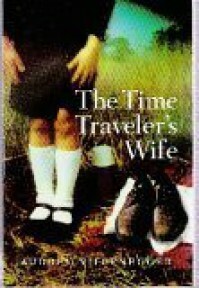 In the core of "The Time Traveler's Wife" you'll not find a love story; you'll discover a philosophy, a way of looking at life, at time and at human relations.